"Veranda of Ocean View Hotel, Block Island, R. I." by David Rubin, Providence, R.I.
Veranda of Ocean View Hotel, Block Island, R. I. Used. Postmark: August 9, 1920. 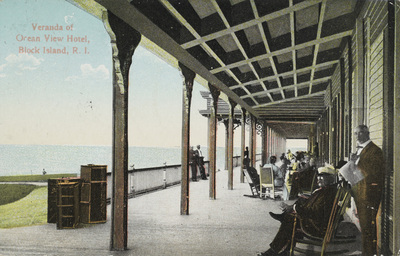 David Rubin, Providence, R.I., "Veranda of Ocean View Hotel, Block Island, R. I." (1920). Rhode Island Postcards. 239.